This view is perhaps the most important view in the App. 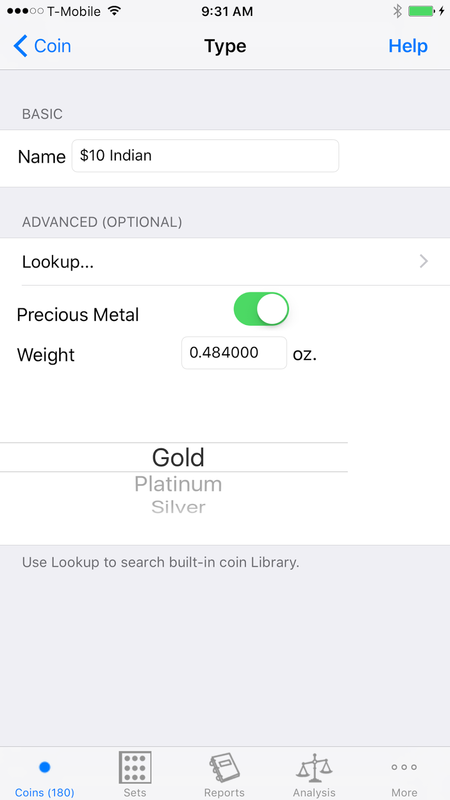 The Lookup option in Advanced allows you to select the coin's Type from the built-in coin dictionary. Selecting the coin from the built-in dictionary will automate some inputs you would otherwise need to enter. If the coin you want to enter is not contained within the built-in dictionary, you can still add it you just need to enter a couple of more bits of information. To complete this section, first select the "Lookup...". This will display a complete list of all US coins ever minted, allow you to choose the exact type you are adding. 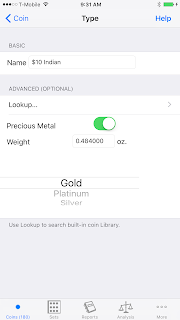 Furthermore, the Weight and Precious Metal type will be automatically updated based on the Type of coin you just selected from the "Lookup...". If the Coin is not contained within the built-in dictionary, you can manually set the Precious Metal type and Weight.